Trestle tables are piled high with donated clothes. Through the door, sandwiches and tea are being handed out in a soup kitchen. Walking into Brandon Welfare Hall is like stepping back in time to the miner’s strike. At the back of the hall, women with prams are collecting nappies and baby milk. Two hand-stitched miners’ banners hang from the walls. The only thing that tells you three decades have passed is the row of donated prom dresses waiting for the Class of 2016’s teenage girls to try them on. This isn’t miner’s welfare, it’s Britain’s first clothing bank. 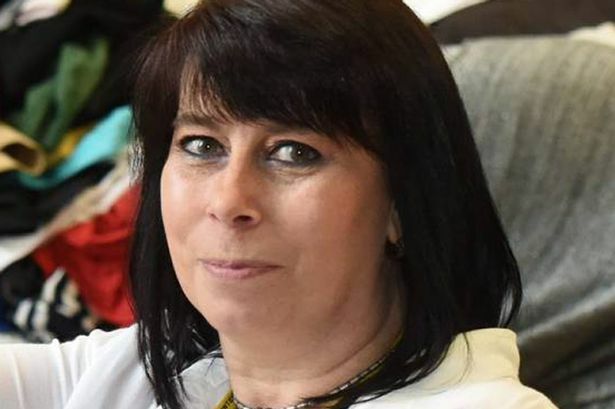 “It’s like we’ve come full circle,” says Dawn Williams, 50, who runs the proudly-named County Durham Socialist Clothing Bank in a hall that once held benefits to support striking miners , and where solidarity is still more than just a word. It’s no longer 1984, but history is repeating itself, not just in former pit villages but in deprived communities all over Britain. This time, the Tory government isn’t at war with miners, but with disabled people, the unemployed, carers and the low-paid. 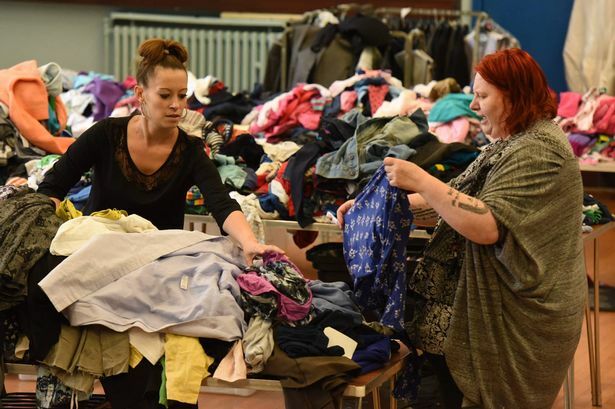 Last month, the clothing bank won Durham’s highest civic award for outfitting hundreds of local people over the last 20 months. Next month, the volunteers will march at the 132nd Durham Miners Gala. The connection is not lost on the people who come here. They know they are not poor by accident, but because of austerity – the benefit cuts, sanctions, poverty pay and zero-hours work decimating their community. “A lot of us met on protests against the Bedroom Tax,” says Chelsea’s aunt Jayne Gowland, 47. A school breakfast club cook, she also cares for her husband, a wheelchair user with severe diabetes, who was injured in a motorcycle accident. Along the row of wedding dresses and groom’s waistcoats, Dawn shows me a price tag – “£1,256,” she says, shaking her head in disbelief. There are rails of suits and smart clothes for interviews. Men can get shaving foam and razors, and there’s a table with soap, toothpaste and tampons. Recently, Dawn kitted out a group of homeless men for their friend’s funeral. “The next week, they brought all the suits back dry-cleaned,” she says. She admits a lot of tears are shed. “There was a man recently who stood outside crying his eyes out,” she says. A local wedding shop, Just Perfect, donates the wedding dresses. The prom dresses are mainly private donations. The community gives the rest of the clothes – the Old Cinema Laundrette recently washed sackloads for free. The food bank next door is part of the Trussell Trust network. Trade unions, including Unite Community, Northern TUC, Durham Miners Association, RMT and GMB, and local companies donate money for suits and toiletries, as well as training for benefits advisers. Dawn gives me a note from a woman called Nicola who has been too shy to speak to me. The clothes bank isn’t a charity. Every item of clothing piled up in the hall is an act of solidarity and hope.